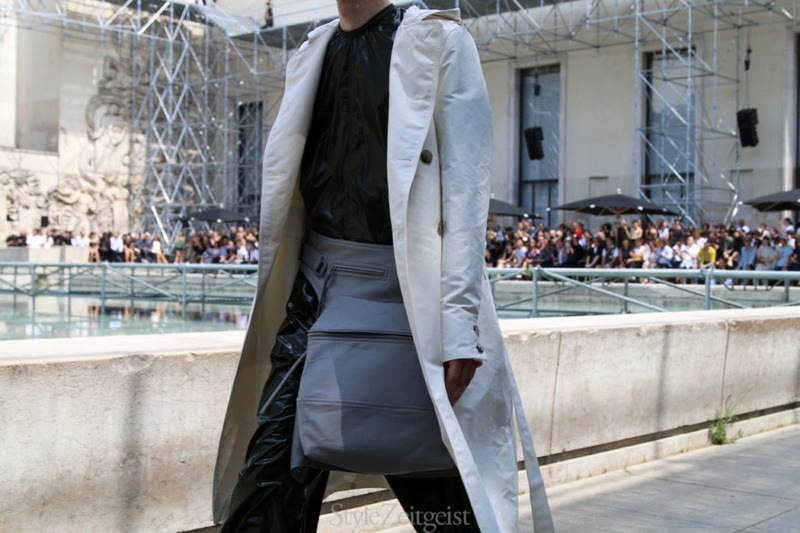 We would like to present to you Rick Owens’ Spring/Summer 2018 Men’s Paris collection.Photography by Eugene Rabkin. Paris was sweltering as my plane landed, and the city’s continuing unbelief in air-conditioning has put a damper on everything. Mercifully, my first show, Haider Ackermann, was held in the well-ventilated grand ballroom of the InterContinental hotel. The almost oppressively opulent setting was a good match for a collection that pulled Haider further into his fantasy world, in which everyone seems to do nothing but lounge in expensive hotel rooms wearing expensive, flowing clothes that in lesser hands could be mere pajamas. But Ackermann is a talented designer, and he usually knows how to elevate his clothes through color, ornament, and just enough structure to give them a dose of reality. Sadly, not this time, as we were treated to an overload of stripes, harem pants, and an (actually refreshing) injection of lilac, which veered squarely into unreality. They lacked the edge that is usually present in Ackermann’s clothes. And though the fractured patterns Ackermann showed might have meant to represent our fragile souls as mere ruins covered by silk and cashmere, their louche luxury was so overwhelming that they failed to move me. The fact that the clothes were showed on young willowy boys added to the cognitive dissonance. 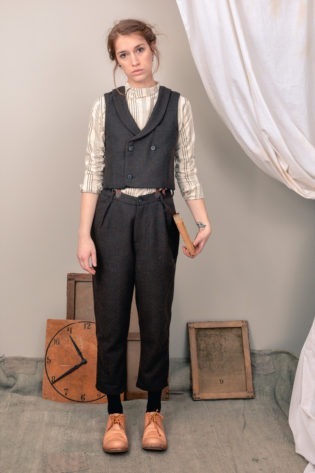 It would behoove the collection to be modeled by male equivalents of Tilda Swinton (is that possible?). Of course, one of the fundamental paradoxes of fashion is that runway clothes are modeled by those who rarely can afford them, and certainly today a minority of Western youths can. But perhaps Ackermann is (unwittingly?) targeting the nouveau riche of the Middle East and Asia? It’s hard to tell. We would like to present to you Haider Ackermann’s Spring/Summer 2018 Men’s Paris collection.Photography by Eugene Rabkin. That Rick Owens knows how to put on a show is no news. And that he always makes the grandeur his own is part of the allure. We’ve seen a heavy-metal band whose drummer spun in the air, a step team, and more. This time, Owens went for the catwalk itself, literally building one in the sky. 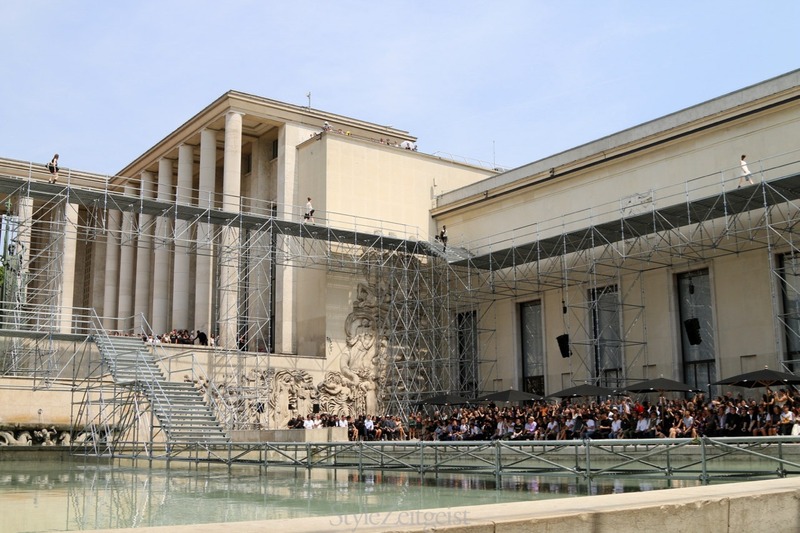 It spanned the perimeter of the Palais de Tokyo’s courtyard and ended up just above its pool (there were also supposed to be water turbines to make waves, but the pool was too shallow). To me the runway reflected Owens’s deep interest in architecture. It was his stab at architecture, but in a fashion way, ephemeral, just for the show, to create a moment and then to be taken apart at once. You didn’t get the thing until you sat down and realized what it was – a monument that was anything but lasting. It was nothing short of glorious. Owens was also kind enough to supply water, hats, and fans (black, obviously) for the crowd that was already overheating (my iconoclasm consisted of wearing a white top to a Rick Owens show). And then came the clothes – to a thumping refrain, “I need a freak” – a continuation of Owens’s experiments with mega-pants, high-waisted and wide, and cropped jackets. 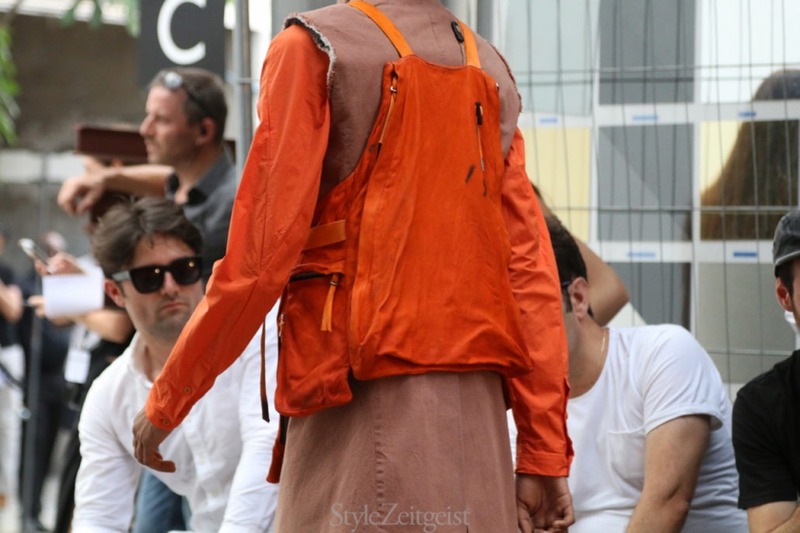 There were also molded tops and sculpted sheer wool gazar jackets, which were my favorite part of the collection. Maybe it was the heat, but there seemed to be a bit less pageantry before Owens’s show, though it was not completely devoid of people in outlandish outfits that simply show up to be photographed without ever getting into the show. You wonder what kind of a pathetic impulse drives them, except that of vanity and exploitation of young designers who gift them clothes in exchange for promotion of dubious value. 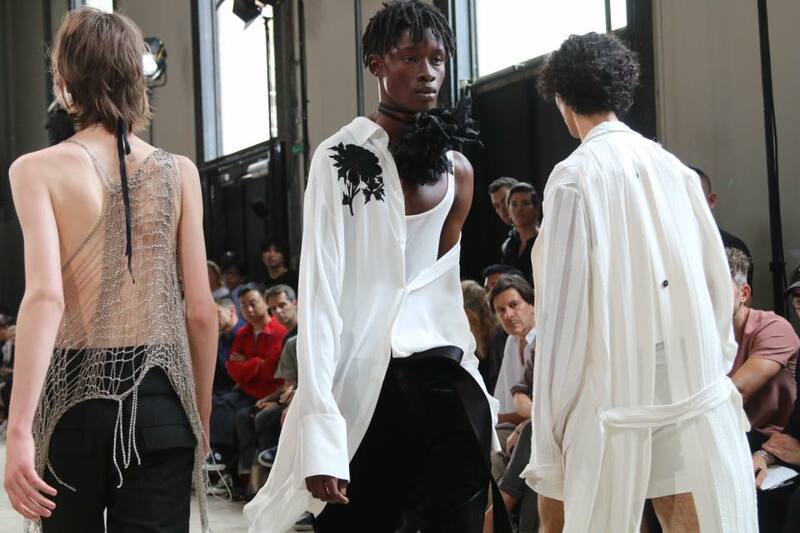 Then it was off to Boris Bidjan Saberi, who could not pick a more unfortunate venue for his show in the debilitating Parisian heat. But, there we were sweating under a glass ceiling of a hardware shop as if in a sauna with the all-black dress code. I felt sympathy for the guys who were modeling a decidedly non-summer collection, with leather jackets and heavy woolen sweaters. Though there did not seem too much forward direction in this collection, the olive and orange, but especially olive, colors were well-executed. Here I confess a bias, as olive is always a color that I think of in terms of expanding my personal wardrobe’s palette (perhaps, some day). We would like to present to you Boris Bidjan Saberi’s Spring/Summer 2018 Men’s Paris collection.Photography by Eugene Rabkin. As I cabbed it to the Yohji Yamamoto show after my fourth shower, my thoughts drifted to this master’s longevity. Some say that Yamamoto is a tired brand, but I often wonder about his seemingly bottomless well of creativity. 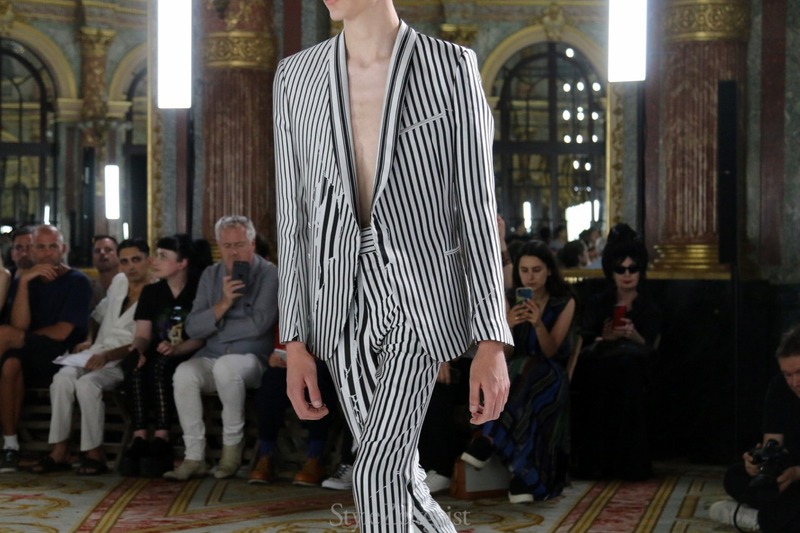 If there ever was a designer who has dug deep with his oeuvre, it’s Yamamoto, who has proven time and again that there is a seemingly unlimited number of ways you can cut an oversized black suit. 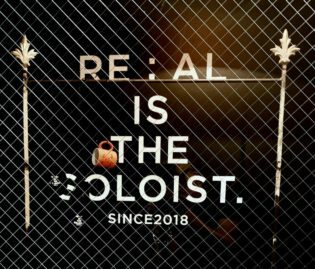 So, it was this season, as look after look came out showing us that the sensei can hit it out of the park on any given day. The show started with something quite unusual for Yamamoto – a series of perfecto jackets. Just when I thought I could take no more of those, all of a sudden they felt fresh when done by a designer who is known for his tailoring style and for whom leatherwork never seemed like a primary interest. In this collection, women seemed to be on Yamamoto’s mind, as they often are. To what end he put pictures of women on the backs of his perfecto jackets and on gorgeously printed long flowing garments is hard to say, because the joyful pinups on the jackets and the melancholy gothic novel heroines on the robes seemed nothing to do with each other. At Dries Van Noten, my last show for the day, things looked markedly different from Yamamoto’s unending romance with romance. Held in the former offices of the French newspaper Liberation, it was relentlessly prosaic in a man-goes-to-office-work way. The ‘70s office, mind you, if you had to judge by the clothes’s color palette. It seemed rather too prosaic for Van Noten, who is no stranger to emotion, until the latter part of the collection that was classic Dries and that saved the day – floral prints on rich silks and modest denims. On Friday, my first show was Ann Demeulemeester, where Sebastian Meunier showed his most confident collection to date, showing that he has found new comfort in combining Demeulemeester’s well-defined aesthetic codes with his own sensibility. Backstage, Meunier explained that the collection was an homage to Robert Mapplethorpe and his New York milieu. And lest you think this was a bit too soon after Raf Simons’s last summer’s collection, which still can be found in stores, there was nothing literal in Meunier’s clothes, unlike in those of Simons; no Mapplethorphe prints on tees and sweatshirts. Instead, it was all elegance and romance, but there was strength in the free-flowing clothes that got the balance of the masculine and the feminine just right. It was all disco at the Comme des Garcons show later that day. The kids who modeled the clothes came out in bunches onto a square catwalk that was lit up in those garishly colored club lights that you can experience at a club only if you have a time machine or go to Brighton Beach in New York. They did a kind of a half-hearted dance, and it was all fun and disorienting. At the end of the show the exhausted audience burst into applause at the performance, but I am afraid the joy of the presentation hid the silliness of the clothes, which were more fit for boys than men. I find Kawakubo’s insistence on infantilizing men puzzling; and if I was in a more serious mood about fashion, perhaps I’d find it alarming, but I am not the one to bring identity politics into this game. Next day I asked the critic Angelo Flaccavento what he thought about my takeaway, and he agreed. A Sacai show has become a highlight of my Paris fashion week, and the one on Saturday was no exception. Chitose Abe put out another impressive collection with look after look that were both wearable and fascinating in the complexity of their construction and the mix of materials. 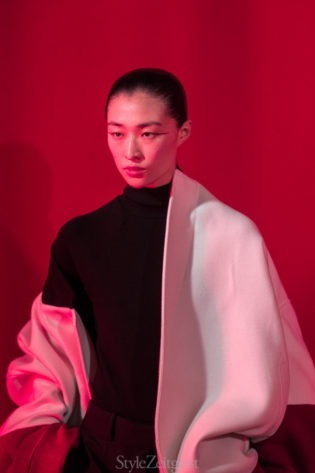 As some other designers are increasingly doing, Abe mixed in some women’s looks from the pre-collection, which added to the show, but also showed how much more interesting womenswear can be when put alongside men’s clothes. The same night Geoffrey B. Small staged a show that was full of emotion, as soft in its presentation as his materials are to the touch. It was his one hundredth season in Paris, and the collection was aptly named “100.” In lieu of the soundtrack a violinist played the works of Oskar Rieding, Alessandro Scarlatti and Ferdinand Kuchler, accompanied by a dancer. In this collection Small continued to express his take on classic men’s tailoring, unstructured, and somehow both ethereal and earthy, which made the entire collection feel human, exactly the thing at the center of Small’s ethos. I started my Sunday at Lanvin, where Lucas Ossendrijver continued taking the label into a sporty direction and erasing Elbaz’s influences, such as tuxedo jackets and floppy bow ties. Instead it was all evening-wear as active-wear. The technical prowess of this formidable design house was on display as always – masterfully executed hooded parkas and pants, and things like that. There was nothing particularly missing per se, but somehow such work no longer feels fresh or relevant; it’s too luxurious for the young and too sporty for the old. 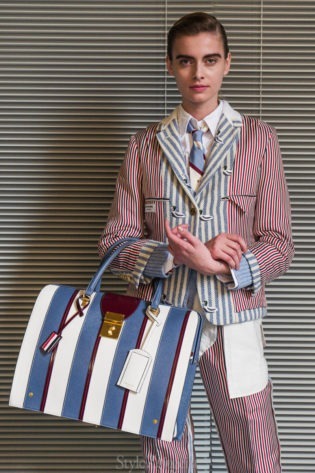 Thom Browne’s evening show was a worthy finale because it was one of the few that got my thoughts racing. Browne showed straight-up women’s clothes on men. Forget gender fluidity or androgyny with its implications of ambiguity – there was nothing ambiguous about Browne’s clothes, they were on-the-nose provocative. Browne famously refuses to talk about his collections, preferring us to make our own conclusion. So, here is mine – it was thought-provoking to see how he put men into slim long skirts and high heels, so they would feel how women feel, constricted and constantly aware of their bodies. And the show did give me an idea for a new article, but I won’t divulge that yet. Copyright notice: All photography by Eugene Rabkin and may not be reproduced without expressed permission.